So sorry for your loss. Really cool story. I have used the hay set often & you're right. For fox it's like flies to a pile of crap. 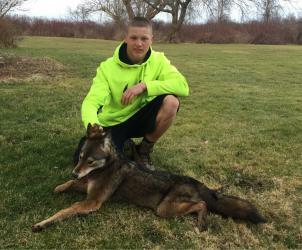 Yotes are a little harder. But you can still make out on them as well. I really like to use the hay set when there's a little snow on the ground. I don't know if it's the site of the hay against the snow or the hay smell, or both. But it sure as heck works. Wow! That's kind of scary. I had a big male yote stalk me during turkey season a few years ago (he's not going to have the chance to do that again). Sorry to hear about your hunting buddy. Losing a hunting buddy is tough. A lot of people quit their sport/hobby after their buddies pass. Hope that's not happening in your case. I've only tried hunting "dogs" a few times with limited success. I mostly stick to trapping (leg hold & Cable restraints). King Slammin,I have used the hay set often & you're right. For fox it's like flies to a pile of crap. Yotes are a little harder. But you can still make out on them as well. I really like to use the hay set when there's a little snow on the ground. I don't know if it's the site of the hay against the snow or the hay smell, or both. But it sure as heck works.Pap,Wow! That's kind of scary. I had a big male yote stalk me during turkey season a few years ago (he's not going to have the chance to do that again).Sorry to hear about your hunting buddy. Losing a hunting buddy is tough. A lot of people quit their sport/hobby after their buddies pass. Hope that's not happening in your case.I've only tried hunting "dogs" a few times with limited success. I mostly stick to trapping (leg hold & Cable restraints).B safe! Yea calling is tough especially if there's others in the area doing the same thing, it only has to happen once and they don't forget that sound. We got to hunt a golf course that was private so we had a advantage, they were running all over and the people called the owner of the course and my brother was a big contractor in there at the time, so that's how we got in there. Yes I haven't deer hunted since bro passed, and I didn't even get my LakeO boat up this year, sad I know but it just seems like I just don't have that push behind me anymore, well I got her all ready for next year!! We worked together like a well oiled machine, my uncles are old school fisherman and just to aggravating as they can't agree with the line set backs that are needed these days, they think 150 back is good enough, yes it was back 1986 but it's 2016, so I just drive out gas not popping a rod and they don't get it the waters just to clear for those short setbacks, UUGG No sense aggravating myself yet!! Thanks for input Ripnlip!!! Even with bow season coming. 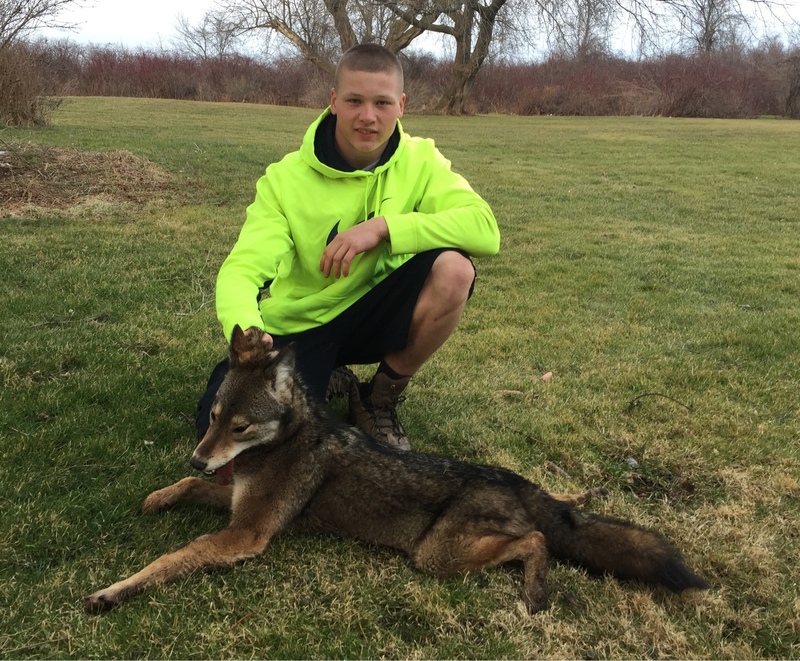 Cant wait to start on the yotes too. Got a brand new .204 waiting to squeeze it off! What weight bullet are you running through the 204? I've heard good things about the lighter weight 32 grain V-max from Hornady. I've heard some reports it screams out at around 4200fps. Even though the ballistics from Hornady say it traveling around 3900 fps. I have a 22-250 that I use the 50 grain V-Max through & it shoots great. My only problem is like I said earlier is I would rather trap canines than shoot them. So I don't shoot it enough to get crazy about the ballistics. Hope you like the caliber. There is another one just past that one that is a week and a half old. Shouldn't be too ripe Bill. Lot of fresh road kills around in the last week. Deer are starting to get on their feet. Love this time of year. I have one across the street from my house but I wont put one in the back yard till after the first. Don't need any tickets. 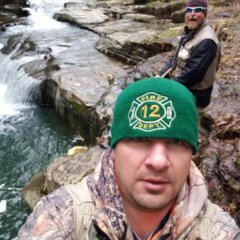 Pretty sure this is the one you are talking about...... great thread that last all season! As the farmers start to cut their corn fields & guys start going into the woods making preparations for archery season the deer will start to move. It's coming fast! When is the archery opener for New York? We in Pa have 2 openers. One is for the Pittsburgh & Philadelphia metro areas (9/17/2016) & the other is the statewide opener (10/1/2016). Cable restraints ( snares ) are a great addition to trapping , i wish new york would get on the band wagon. Cable restraints passed the BMP ( best management practices) which is why pa can use them now. Very awesome anytime but late season when things freeze up good they still work. Another nice thing about the restraints is the season is pretty long. In Pa. it runs from 12/26 till mid February. But I usually stop a few weeks earlier because the fox & yotes will start to rub. No sense wasting time on them if you can't do anything with the ones you catch. Has there been any talk in NY about restraints? Im from south eastern PA. I dont know whether or not new york has snares on the table or not, i can only imagine the trapping fraternity in new york brings it up every year to get it legal. Wasnt that long ago you could use 220's on land in mew york, not sure why they wouldnt allow cable restraints with relaxing locks to minimize dog deaths???? Don't try to figure out the processes. You'll drive yourself crazy. Explain to me how in Pa the can fine you for not having a seat belt but allow you to ride a motorcycle without a helmet? I think that should be a choice of the driver. No worries bro, this is a great place to be. 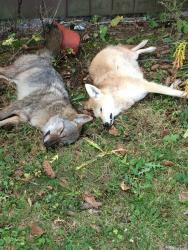 Looking forward to seeing a lot of dead yote and fox pics this year. I like the different color phases the most! Hopefully will get some cool ones this year!